In yoga, we incorporate balance postures into almost every class. Why? First, because they are fun! Second, because they force us to focus and pay attention to what’s happening in the body in relation to our surroundings. 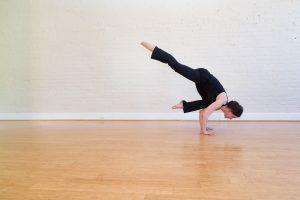 Particularly in one-leg balance poses like Warrior III, Dancer, or Half Moon, we have to coordinate our breath with our gaze along with the movement and holds. When we work each side separately we discover the strengths and weaknesses between them. In reality, no body is perfectly symmetrical. The imbalances in our bodies can mirror the imbalances in our lives. Are you flexible in some places but also find you are not as strong in those same places? This can be a reflection of how we give-in too often. In fact, sometimes I am a complete pushover. I’m happy to bend a little to where it can make things easier, but being overly flexible can create instability both in the body and in my schedule! You don’t have to take every stretch to it’s deepest and you do not have to say yes to everything when you just know it’s too much. Some parts in the body are a little tight making it harder to achieve the shapes we are going for and learn more about ourselves. This is where patience and relaxation come in handy. Always resisting and refusing to try anything new get in the way of growth. If you are scared to try Bootcamp or Sweat & Refresh, why not give it a try? 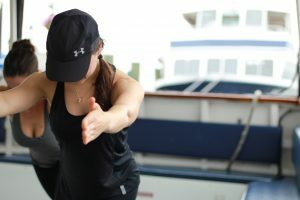 What does it mean to “maintain your sense of balance?” Did you ever had a sense of balance to begin with or do you always feel like you are always teetering, about to fall? For some people achieving a sense of balance means saying ‘no’ more often but for others it can mean saying ‘yes.’ Only you know the answer and in different spheres of life the answers can be different. For example, at work, saying ‘no’ can be empowering. You do not need to take the lead on another project. In your social life, however, maybe you should say ‘yes’ a little more. “Yes! I’ll go to that museum with you! Yes! I’ll try that new restaurant.” The idea of balance is to not let one part of your life overtake the other. We strive to offer a well-rounded variety of classes to keep you strong and balanced in body and mind. You are not the same from day-to-day, so why should every class be the same? Sweat & Refresh is going to challenge you. Balance this with Stretch & Refresh to unwind and improve flexibility. Match your Vinyasa with Slow Flow in order to keep yourself centered and deliberate as you flow. Seniors can benefit from senior yoga or Mindful Movement. Refresh Yoga Center is a boutique yoga and fitness center in Old Town in Alexandria, Virginia. We also serve the communities of Ft. Belvoir, National Harbor, Arlington, Del Ray, Potomac Yard, Annandale, Belle View, Belle Haven and Oxon Hill. Offerings include beginner yoga, stretch classes, bootcamp (Sweat and Refresh), prenatal yoga, and yoga for seniors. We are on the 2nd floor at 110 King Street near the Torpedo Factory above the Creamery Ice Cream Shop.